If this statement is uttered I will either switch to Engineer (if I agree) or ask why we don’t need a Pyro. “Why,” ask I, “do we not need a Pyro?” An innocent enough question, surely. But on certain servers I’ve had a variety of Pyro-trashing results. Apparently some people consider this class ineffective against the invading ‘bots, or downright useless. Now is the time to falsify these claims. I hope you’ll agree with myself and my pyromaniac friends when I say it’s very useful to have a Pyro on your MvM team. Let’s look at these clanking adversaries. They work for a man who appears to be at least 150 years old yet has a daughter still before her teens. That’s not actually relevant, I just think it’s weird. The robots themselves have some interesting design features, much in the style of the whole TF2 world. They drop moneys when killed. They speak in a mixture of human English and beep-boop. They are blue. And, for some reason, they are flammable. Yes, these creatures made of METAL can catch fire and take as much burn damage as their human equivalents. They might as well be made of cardboard. Fire is a viable weapon against them. Who uses fire to fight? Oh yes, our deranged Mr (or Ms) Pyro. Interesting. Now consider the characteristics of the Pyro’s stock flamethrower. Here’s a weapon that wreaks havoc in more ways than one. Its primary function is to emit puffs of hot orangey stuff that ignite enemies (including, I remind you, the robots). These puffs have a wide spread compared to the standard weapons of most other classes, so they can hit multiple enemies at once. They can be fired continuously until one runs out of ammo. All this makes the flamethrower great for setting a number of robots ablaze, for instance a group of those fast-moving afterburn-vulnerable Roboscouts. Then there’s its secondary feature, the airburst. It takes a lot of practice to get good at deflecting bombs and rockets with this, but its very easy to deflect bigger, slower things. Like robots. A well-timed airburst can send one flying away from a target, or even one that’s badly timed but pointing in vaguely the right direction. A robot ready to deploy its explosive payload can be forced away from the bomb hatch and then picked off by one’s teammates. This even works with giant robots; anything except a tank can be airblasted. 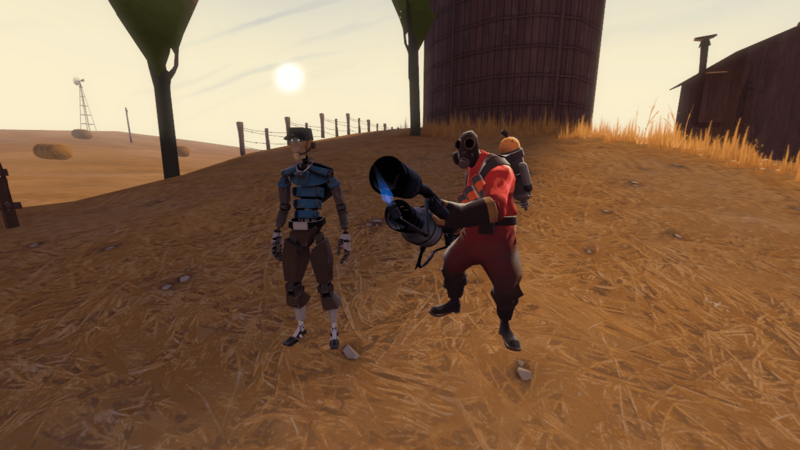 So a Pyro can be a big help both at the front line, roasting those Scouts, checking for Spies and causing the usual carnage, and back at base, where the airburst function can delay larger enemies. Then there’s also the shotgun (or flare gun) and a melee weapon available to use. 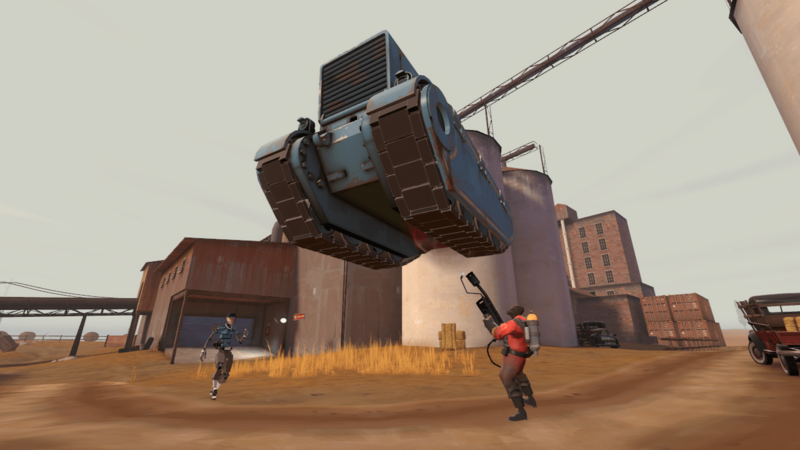 So I ask you: how is a Pyro less useful in MvM than any other class? I say every team of defenders should have one or two on their team (alongside an Engineer and a Medic, of course), in order to take advantage of some of the wacky weaknesses of the machines. And I haven’t even mentioned the upgrades Pyro gets in this mode. You can explore those for yourself. Happy gaming!